For our fourth day, we travelled deeper into the Sacred Valley. Our end goal was to stay in Ollantaytambo, because that's where our train will be departing for Machu Picchu. From Cusco, Yure picked us up and we passed by this adorable llama and alpaca farm. Until this trip I didn't really know the difference between them LOL! So Awana Kancha is a community-centred farm that does workshops and showcases the process from shearing to making the yarn and the dyeing and all that fun stuff. Aside from learning the difference between the llamas and alpacas, I also learned that they had dreadlock versions of these beautiful animals. LOL! Chewbacca llama coming up! Llamas are taller, with longer limbs and necks. Personally this skinny one looked like a kangaroo to me! This one was an alpha. Wanted to get all of the food! C having too much fun feeding the llamas. Can't wait to see the footage! And yes that's the chewbacca version of the llama! The shorter, fluffier kinds. Where the fluffy scarves come from! The dreadlock version!! so cuuute! Looking at C for food... that's why they're all not looking at ze camera. Then, we took a peek at all of their natural dyes, which were seriously to die for. I wish I knew about it, so we could do a workshop and I could learn more about these amazing things they used. It was so beautiful. I was so trigger-happy! Look at all these colorful potatoes and corn!! The giant corn from Peru was all so yummy! I also discovered that they had their own way of preserving these crops for winter.. freeze drying! I thought that was so cool. I really appreciated how these civilizations worked with their surroundings for survival. And this adorable kid kept following us around - apparently he had fallen yesterday hence the scars of war. This place also had a little shop, and I wanted to support the community so I did a little shopping. They also had the best deal for yarn, in my opinion! 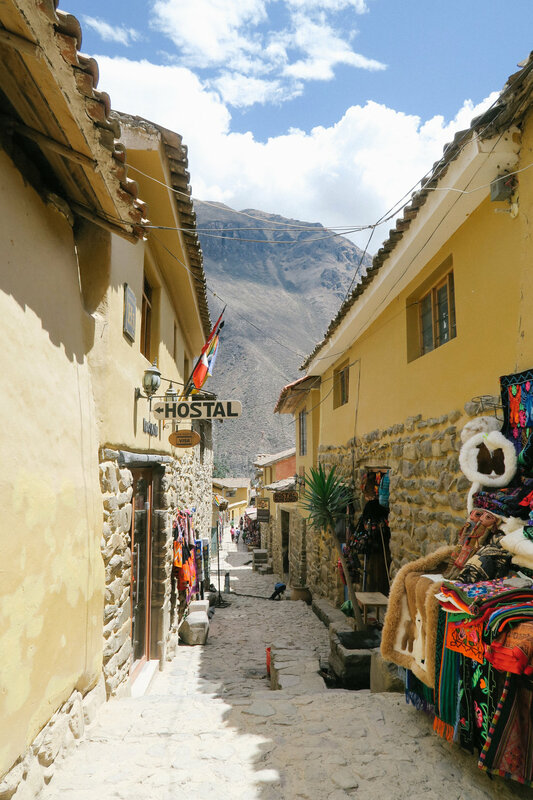 Then, we finally headed to Pisac Ruins + Market! This was one of the views on our drive there. Isn't it amazing? Look at how they utilize the mountains and all - no land is wasted! Super cool to see more terraces and the quality of the stones built in this area, too! Then we headed off to the market, which is the biggest one in Sacred Valley. It's a great place for souvenirs and all - we were there for 45 minutes! Typically C and I are quick shoppers but this was so extensive that by the time 45 minutes were over we hadn't even finished the entire thing yet, and we didn't really buy much. We could've stayed longer since it's private, but we didn't really want to buy much. Peru is a travel-light place for sure! Seriously amazed at how they lugged these stones up this place. Our guide said that it would've taken 100 people an entire year to gather the rock and polish it to this point. Absolutely mind-blowing. One thing we discovered here in Peru - aside from the fact that there are a lot of poor people, is that people tend to carry the whole world on their backs. Throughout our trip, everyone was carrying all sorts of merchandise and materials for work, babies and lambs and everything else. It almost felt like an ancient country, in a completely different era. After this, we hopped back onto the car and headed to Ollantaytambo, where we were going to stay for the night. Ollantaytambo is the house of Ollantay, one of the Inca's important crew. This ruin was incredibly massive. I also discovered it was the home to thousands and maybe millions of air plants!! OMG take all my money! You'll have to go up the ruin to see the view of this historic city, filled with original royal homes and cobblestone streets. Truly felt like we were back 400-500 years ago. Saying hello to all these MOUNDS of airplants. I so wished I could take them all home! Then we headed back down this ruin, and checked it at our hotel. 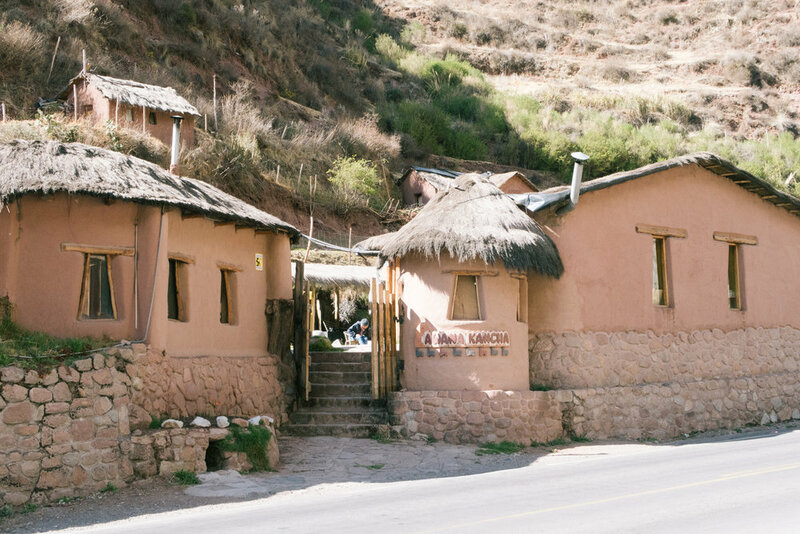 Much later on, we decided to walk around this cute little Incan town. All the roads are super straight and they have canals that go through them. We had lunch at El Albergue restaurant, which was really yummy. Relaxed throughout the late afternoon, and at night there was a little sprinkle of rain and fog which was so dramatic. Perfect for a night to be stayed indoors, and tomorrow we were taking the train and heading to Machu Picchu!